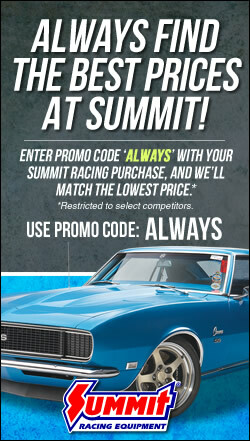 We’ve got the answers—the Summit Racing tech department tackles your automotive-related conundrums. Last week, we tackled a rich air/fuel condition. This week, we’re revisiting the popular subject and offering up a few more possible solutions as well as some general tuning tips. Q: I have a 1964 Nova that I built from scratch. I put in a 355-cubic-inch small block, with 9.75:1 TRW flat top pistons, 64cc heads, 280-degree duration/.486-lift COMP Cams camshaft, a Holley vacuum secondary carburetor on an Edelbrock Torker Intake, and an HEI distributor. The car also has a Turbo 350 transmission, and a 10-bolt rear-end with 3.73 gears and a posi. The problem is, the engine is running too rich! I have rejetted the carb several times with no improvement. I have checked the primary power valve weekly, and it is good. I am now running a #65 jet in the secondaries, and the thing is still too rich. I gap the spark plugs at .050-inches. What gives? In your case, you made all the adjustments you could make, and you’re still running too rich. That means you should go to a smaller cfm carburetor. If you shift gears manually, try a 650 cfm carb with mechanical secondaries. This should also yield a crisper, cleaner throttle response thanks to the higher air/fuel velocity.